Have you heard about the benefits of baking with coconut flour? As the interest in grain-free diets continues to rise, many cooks are looking to find a replacement for all-purpose flour in their baking. But, before you switch out your flour, there’s a few things you should know about using this popular alternative. Coconut flour is a soft, naturally grain- and gluten-free flour produced from dried coconut meat. It is a natural byproduct of coconut milk production. When coconut milk is pressed from coconut meat, bits of solid coconut meat are leftover and this coconut meat that is leftover after the production of coconut milk is then dried at a low temperature and ground until it produces a soft, fine powder which is then suitable for baking. 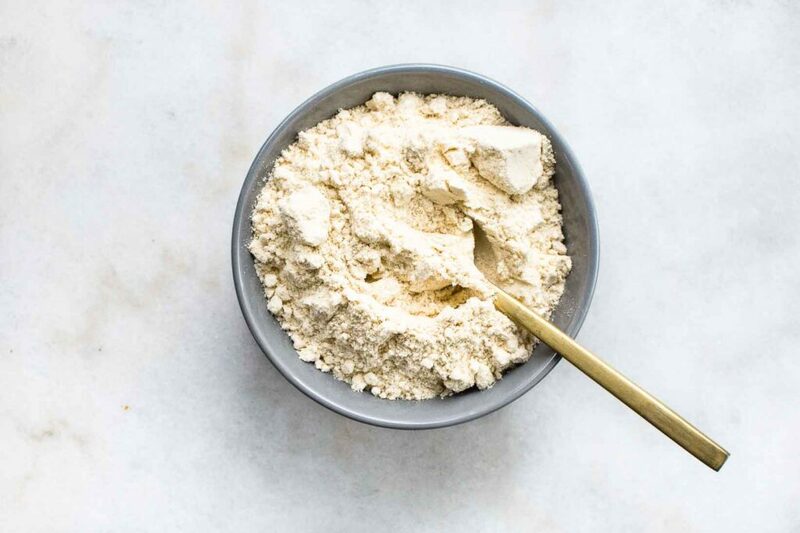 Popular among those adhering to grain-restrictive diets such as paleo diets, GAPS , SCD and ketogenic diets, coconut flour can offer a gluten-free and protein-rich alternative to traditional grain-based flours. What are the benefits of coconut flour? Coconut flour is denser in many nutrients than traditional grain-based flours. It is also naturally gluten-free, so if you’re on a gluten-free diet by necessity or choice, you can enjoy it. Coconut flour is fairly high in protein, fiber and fat, and relatively low in carbohydrates by comparison to other flours. A single serving of two tablespoons contains a whopping 5 grams of fiber and 3 grams of protein as well as 1.5 grams of fat. It’s this combination of nutrients – fiber, protein and fat – that makes it so filling. It is also exceptionally rich in manganese, an essential nutrient that is critical for many processes and functions within the body. Notably, manganese it helps to support bone health, and it helps your body better use other nutrients like choline and biotin. Even more, it acts as a powerful antioxidant and anti-inflammatory nutrient. In addition to manganese, coconut flour also contains other trace minerals like iron, potassium, phosphorus, selenium and vitamin B6. Coconut flour is commonly used in baking, particularly paleo, grain- and gluten-free baking. It can be used to make cakes, cookies, breads and muffins. While it is a versatile baking flour, it can be challenging to use, and you should rely on established recipes, especially if you’re new to baking with this alternative flour. Coconut flour is particularly absorbent, and a very small amount of flour will absorb a very large amount of liquid. It also tends to have a drying effect on baked goods, because it is so absorbent. The best way to counteract its drying effect is to use plenty of eggs when you’re baking. The protein in egg whites helps to provide structure to baked goods while the yolks provide moisture. Foods baked with coconut flour can often have a gritty texture, so it’s best to sift the flour thoroughly before you bake with it. Additionally, it’s good practice to separate your eggs, beating the flour with egg yolks and then beating the whites separately until they hold stiff peaks. You can then fold the whites into the egg yolk and flour mixture, and this improves the natural heaviness of many baked goods that use coconut flour as an ingredient. Coconut flour is tricky to work with because it is not a grain-based flour. You cannot substitute coconut flour for all-purpose flour in most recipes, and working with established recipes is the best choice. Coconut flour cannot be substituted on a 1:1 ratio for all-purpose flour, or most other flours; however, you can begin by substituting 1/4 cup coconut flour for every one cup all-purpose flour. In addition, every 1/4 cup coconut flour typically requires one egg for both moisture and structure. You may also need to increase other liquids in the recipe or make small adjustments to baking times. Use additional liquid because coconut flour is very absorbent. Use additional eggs to give baked goods structure and moisture. Incorporate egg yolks into coconut flour and other dry ingredients, and whip the egg whites separately, and then fold them into the first mixture to make baked goods lighter. Substitute coconut flour for all-purpose flour at a 1:4 ratio, and remember to add 1 egg for every 1/4 cup coconut flour. You can find coconut flour in most natural grocers and health foods stores, as well as in many supermarkets. If you cannot find it locally, you can always purchase it online here at a discount. While coconut flour is dense in protein, fiber, fat and many micronutrients, it is also rich in salicylates. Salicylates are naturally occurring chemicals in many wholesome foods, including coconut. Some people react negatively to salicylates, and salicylates may exacerbate headaches and hyperactivity for them, or contribute to skin issues like eczema. For these people, coconut flour may not be the optimal choice. Coconut flour can also be gritty, and it can give everything that is made from it a slightly coconut-like flavor. While this can be a pleasant experience where that flavor is desired, not every recipe or partner ingredients will benefit from that flavor. While you can use the tips above to try to convert your family’s favorite recipes to recipes that use coconut flour, you may find yourself wasting precious and expensive ingredients while you get your technique down. Instead, one of the best practices is to simply use established recipes from a quality source.Coconut Cake is light with a flavor reminiscent of classic yellow cake, and it’s perfect for birthdays. Paleo Mini Banana Muffins are delightful and nourishing choice for breakfast. Coconut Pineapple Upside-down Cake is a fun take on the classic. Coconut Madeleines are easy to make and excellent with tea. Coconut Flour Bread is another option. I find that “soaking” coconut flour makes a much better textured final product. I mix the coconut flour with the liquid ingredients from the recipe. Beat very well to get rid of the clumps then let the mixture “soak” for at least 15 minutes. This helps remove the graininess that I found off putting in baked goods made from coconut flour. Thanks for the tip, Andra! I will have to try that. I like to add an extra egg to coconut muffins. Thank you…do you use coconut oil in your baking too? That seems like an awful lot of eggs/cholesterol. Is that not a worry or a trade off? I want to tackle a rum cake that already calls for 6 eggs,…I need to use 12 eggs now? The ‘too much colesterol’ from eggs idea is a myth. Use as much egg as you like! You can use ground flax. ; 1Tbs of flax to 3Tbs of water for each egg you are replacing. It needs to set for a while to thicken slightly. You can use chia seed, ground and soaked in water. Very nutritious, also. Stewed Apple will help keep it moist. Pumpkin or applesauce are good substitutes for egg & oil although I have not tried them with coconut flour. Andra – I am new to the coconut flour – tried it once and it was grainy. I see your recommendation about soaking for 15 mins. Any new updates on your experiences? Thanks. Please use the word hyphenate, instead of “hypen”, which is a noun, not a verb. Simple ratio for baking with coconut flour: One ounce flour to one egg. Txgirlwonder — that ratio is in this coconut flour pancake recipe I use from a paleo web site: http://paleopancakes.co/paleo-pancakes-fluffy-coconut-flour-pancakes. I have a gluten allergy (not celiac), try to minimize dairy, and watch carbs, but if I’m wanting a “treat” breakfast on the weekends or have a big workout planned I’ll make a half recipe of this, using 2 eggs, almond milk instead of coconut milk, skipping the sweetener and cooking it in coconut oil. I serve it with some berries and no syrup. It does turn out kind of savory — I am wondering if I could make mini pancakes from this recipe and serve something savory on them as a party app some time (smoked salmon and creme fraiche, creamy mushrooms and some parm, etc.). Like other posters on here, I also share concern about my cholesterol, but also feel that eggs are not the enemy if sourced carefully and eaten in moderation. Made for one, this dish has only two eggs — which is an appropriate egg portion. In addition, the 2 eggs plus protein in the coconut flour tote up to a protein-rich breakfast with about 20g protein, and the meal (with fruit) has over 10g fiber, and way way less carbs than traditional pancakes. My nutritionist even OKs this for now-and-again variety meal for my particular diet (which involves distributing protein in a particular way during day to modulate blood sugar, and using only low-glycemic and nutrient dense carbs — mainly fruit and nutritious veggies, small amounts of brown rice or squash or the like only at breakfast and lunch). I want to make the coconut flour cake recipe, however, we have been told by our doctor to lower our cholesterol intake. The recipe calls for 12 eggs. Can we substitute half of the eggs by using only the egg whites? so “egg replacer” wouldn’t work in this instance? I bake ALOT With coconut flour. I use No eggs. No dairy. No oil. Use another flour such as almond flour to help bind it. They both have alot of natural oils as well. Where do you find recipes with coconut flour no eggs? My friend cannot have eggs. I eat at least 8 eggs a week, sometimes more when I make a quiche or brownies. The eggs are from my mom’s free range hens that eat very healthy themselves, like kale from my parent’s garden and no commercial feed. I have excellent cholesterol, year after year. I also eat lots of fats, coconut oil, nuts, raw grass fed butter, grass fed beef, cheese and ice cream. I have no heart disease, good BP, excellent triglycerides, generally excellent lab values and at 47 years old my PCP thinks I am lying about my age and I am really only 30 years old. So eggs are NOT the enemy. Oh, you funny! 🙂 me too im 46, and look 30, i think i eat even more eggs a week 🙂 and yes, a lot of bacon too, but also i make my own fish and beef stocks, i eat a lot of soups. My grandparents ate a LOT of bacon and they never ever cheecked their cholesterol, they passed away at 88 peacefully, and as all i remember every day of the week we had bacon and eggs for breakfast, only on weekends we had pancakes or french toast, since my mom didnt have much time to cook before work. Check out the Primal Blueprint. You can have bacon 😉 and he explains why it’s not “bad” for you. Yes, but some people have genetics working in there favor to keep cholesterol/pb etc down. THANK YOU RENEE….EGGS ARE NOT THE ENEMY, IM GLAD SOMEONE FINALLY SAID THAT. WE EAT 2 EGGS SAUSAGE OR BACON, EVERYDAY & HAVE FOR YEARS WITH NO PROBLEMS..IN PERFECT HEALTH. WE ARE IN OUR 50 NOT TAKING ANY DAILY MEDS. LOVE COOKING WITH COCONUT FLOUR. PEOPLE ALSO SAY WE LOOK LIKE WE ARE IN OUR 40’S. THE WHIPPING OF THE EGG WHITES & SOAKING THE FLOUR IN ANY OF THE LIQUIDS DOES HELP WITH THE TEXTURE & IT BEING LIGHT & AIRLY. YOU JUST HAVE TO TAKE A FEW MORE STEPS & IT IS WORTH IT. HAPPY BAKING TO EVERYONE! Would love to know where I can find recipes with coconut flour and no eggs or dairy. My daughter is allergic to eggs and casein and gluten. I love coconut flour but have not found any good recipes for muffins or baked goods without the eggs and casein. I would like to bake bread and pancakes with cocoanut flour. But I can’t use gluten, dairy and eggs because of allergies. Does anyone have a good bread recipe I could use? I use almond milk and cocoanut milk and I can use quail eggs but it takes about 5 quail eggs to 1 chicken egg so I wonder if I could substitute ground flax and water? for no casein you might try jersey cow or goat milk. its the A1 casein protein which is the allergy, of which those two’s milk contain none. What you’ve posted is factually inaccurate. Both A1 and A2 beta casein can be allergenic. Casein can be found in cows milk and goats milk. Soy has similar properties as well. My son had to be casein free for his first 3 1/2 years. We were told NO COW, GOAT, or SOY. For those concerned about your cholesterol I highly recommend you watch the video called The Bitter Truth About Sugar. It is from an MD and it breaks the effects of cholesterol and it’s link to sugar down to nearly the molecular level. Can you please point me in the direction of egg free or reduced egg coconut flour recipes? I find everything I bake with coconut flour too eggy. Just wondering where the peer reviewed evidence is that eggs raise your cholesterol? doctors have been telling patients the world over (like my dad who has cholesterol) that eggs raise cholesterol. however, a prof called Tim Noakes (3 doctorate degrees in nutrition and fitness) has written a book called Real Meal Revolution. It reveals that most fats are good for you, whereas carbohydrates and sugar are our worst enemies. Sugar speeds up ageing process, is the only food cancer feeds on, and it makes the body CRAVE food. (ie you get hungry again a few hours after eating it). see some clips on youtube from prof noakes. peace. Do you have a pancake:waffle recipe that’s plant based? Help!!! Everytime I bake with coconut flour – the taste of salt overtakes the flavor. Or it is an awful taste. I just baked coconut flour-cornmeal banana fritters- I added 1/8 tsp salt instead of 1/4 tsp. They are just horrible. Any suggestions? Thanks. Eggs do not clog arteries. Mostly, I would say that some people get plenty of B vitamins and eat low carb enough to make their cholesterol LOOOOWWWW. Sandy, the mainstream dietary advice to avoid eggs and other cholesterol-rich foods is misguided. It’s a case of mistaken consensus because saturated fat and cholesterol have never been proven to cause heart disease. Rest assured that they have been vital parts of the human diet for eons. Smile and nod to your doctor, then go home and make these muffins. Eggs are fantastic nutrition, especially if they are from pasture-raised hens out in the sunshine and grass eating bugs and such. Throughout the years, as the increase in doctors advising to watch cholesterol increased, the rate of heart disease increased. Just eat real food from quality sources and your health will get better. Good luck. Sugar is the enemy …..yes, even when we’re talking about cholesterol! Can some of the excessive amount of eggs in coconut flour recipes be replaced with wet ingredients like pureed fruit? Or would that ruin the proper binding of the ingredients? Good question! I was wondering the same thing. Like what about water or milk? In the right recipe, vinegar, wine, or liquor? And for those who can’t or don’t want (so many) eggs, what about flax meal soaked in water? I haven’t tried it, but I’ve heard that it can replace eggs in baking. I’m not sure about the ratio, but I THINK it’s l like 1 tbsp flax to 3 tbsp water for each egg. When baking with Coconut Flour, you can cool your baked goods out of the oven and right into the freezer for 45 min. The steam from the baked goods and the freezer work together to product moisture into the baked goods. am baking a cupcake for my son who is on a gf-cf-sf – modify Gaps diet and grain free the recipe calls for coconut flour and almond flour but my son is allergic to almonds so what can i use to substitute the almond flour? do u think i can use arrowroot flour or flaxseed ? its for his bday .. please help me …. Great post! I’m writing a post about banana chocolate coconut flour muffins and will include a link to your post since my recipe uses coconut flour! Do you have some recommendations for flours for baking besides grain flours/nut flours/coconut flour? I hear something about using beans as a flour. Hmmm.. And… what else? Thanks for any advice! (I’m on the SCD diet if that helps). I have discovered coconut flour about 6 month ago and ever since it has been learning curve for me. Mastering traditional pancakes was the first step, then I moved to smaller cookies and cakes, favourite currently being chocolate chock biscuits. The main factor I appreciate about coconut flour is the fact that in general, we tend to eat less of each serving as it is much more filling then bakes from normal flours. Topped with chocolate or other frosting, with some vanilla essence, it is fantastic baking I can recommend to all. Has anyone tried replacing eggs with chia gel? A tablespoon of chia gel can be substituted for one egg. To make chia gel soak a Tbsp of chia seeds in 2 Tbsp warm water. Mix a larger batch in an air tight container and store in the fridge. My daughter & I are vegetarians-vegans since my cancer diagnosis back in 2007. Nutrition is everything in this household. I have had great success replacing eggs* with mashed bananas. I am not concerned about cholesteral I am concerned with the egg industry practices. That and I have a history of not being too keen on eggs in the first place… eeewwww. Thanks for this! I have two eggs until we can make it to Costco next, but I have a lot of chia. I was perusing these comments for a good egg replacement. Wow what a great discovery today of the Coconut flour. I never knew. I appreciate all your comments. I’d like to make this tomato bisque but need to replace the whole wheat flour with coconut flour. It calls for 5 T of whole wheat flour. What amount would you suggest if replacing with coconut flour? A couple of T? Thanks so much! I have never used any flour when making a tomato bisque as reducing the liquid should help to thicken it. Noticed someone asking about substituting almond flour for nut allergies. I’ve recently found a great nut substitute that I use when baking for my son (birthday cake etc), they’re called Tiger Nuts or Chufas and come from Spain. They’re not anut but a tuber of a grass, but they taste like nuts and canbe bought whole or ground. To use in baking, substitute 90% of the weight of nuts with tiger nuts (so for every 100g that a recipecalls for, use 90g of tiger nuts). I’ve just made pancakes with it, 2 mashed bananas 4 eggs (separated and whites whisked until fluffy) and 4 tablespoons of coconut flour. Mixed the egg yolks, banana and coconut flour then loosened and folded in egg whites. Fried them and served them with bacon and a little honey. I wasn’t sure at first but my 17 month old has just scoffed the lot. I couldn’t ask for a better result. I had heard that coconut was bad becuase it was a cause of heart disease amoung other things. Just recently my husband brought home a book that tossed any preconceptions about coconut out the window. If you like to read get this book, it is a real eye opener The Healing Miracles of Coconut Oil by Bruce Fife, N.D. forewarded by Jon J. Kabara, Ph. D.
I am trying this detox regimen and I cannot have eggs… Im trying to make avocado fries and have already thought of some substitutes for some of the ingredients and what not. I looked up egg substitutes and fell upon a website that suggested mixing water and flour to make a paste for something that you would normally coat with eggs and flour before you fry it… I cant use regular flour and i could use wheat flour but I was curious about using coconut flour… Is that possible? I’m trying to find a good replacement for coconut flour. My husband has allergies to coconut, tree nuts and most things that grow on trees. I would like to find something I can bake for him for his birthday coming up soon, but am not having much luck. Any suggestions? Very beneficial blog. i will follow this blog. keep up the nice work. I’m on a low carb diet due to diabetes and a lot of these recipes with coconut flour seem excellent but use a lot of honey which I cannot have. Is it possible to use a substitute such as Stevia or do you have any other suggestions? Hi Vicki, I use Stevia for a lot of things, but as it’s super sweet, you need to find something to bulk it out. I’ve successfully used maltodextrin – which is a sugar that has bugger all sweetness to it, it’s used in beer making!mixed with Stevia for sweetness. Also, it’s usually available in the supermarket in the home brew section. I’ve also used Rice Malt Syrup, sweetened with liquid stevia in place of honey, and maple syrup. I’m not sure how they would go with diabetes, but I’m sure if you contact one of the diabetes groups, they will be able to point you in the right direction. I have been using coconut nectar as a honey replacement (1 to 1) and then I add 1 tablespoon of Stevia for each 1/2 cup to make it a bit sweeter. Great post! Thank you ! Ive been searching around for how to substitute regular flour with coconut and almond flour and this is extremely helpful. Dana, can he have buckwheat flour? I have used it for baking with fairly good results. Hi, I found his recipe for a vanilla cake, but it uses coconut flour. Graininess in making any baked goods with coconut flour puts me off too but I like how light the baked goods are in my belly. I will try the soaking method. I hope it helps. I have been making my family’s birthday cakes for the last several years and have always had the guilt of feeding my children a sugary lump of wheat flour. Since finding and experimenting with coconut flour, I have been able to feel good about creating cakes that are dense in fiber and protein. I make a chocolate birthday cake and I calculated it out to have almost 10 grams of protein per slice, as opposed to the 1-2 grams in a normal chocolate cake. I hear a lot about the texture of coconut flour products as being dense, grainy or just unappetizing. I think the best thing you can do is continue to experiment and not give up. The benefits of being able to make a cake or muffin with coconut flour by far outweigh the breaking in period to get you used to the different texture. I’m having some small security issues with my latest site and I would like to find something more safeguarded. Does anyone have a good recipe for pie pastry. My sister is celiac and I would love to bake tarts or a pie for her once in awhile. I’m just curious – I have been asked to make a gluten-free banana bread and I’m thinking coconut flour will work best with this. I’m also considering adding greek yogurt to the recipe – I’m supposed to bake this for one hour when I used wheat flour – will the cooking time be off, too? Increase or decrease? today i tried to make coconut flour funnel cakes. i used coconut milk and coconut oil to fry. my attempt was a failure because i failed to read the conversion instructions and didn’t know how absorbent the coconut flour was. However, the flour, oil and milk smelled really good. i may try again after more research. I’m finding that coconut flour tastes grainy in my quick breads and stuff when they’re hot, but when it’s fully cooled to room temperature it congeals into something remarkable, everyone who’s tasted it was blown away. The coconut flour I get has an amazing, slightly spicy aroma that works great with vanilla, caraway seeds, raisins and walnuts. My favorite way to make it is with 2 kinds of sweet potato, though I’ll use buckwheat instead sometimes for a change. There’s also an equal amount of tapioca flour to balance out the coconut. I tried making cookies before I found this site. I used 1 cup of coconut flour (Red Mill) in place of 1 of the 2 1/4 cups flour in a typical Toll House recipe. (I used dark chocolate chips.) I didn’t add any more eggs or liquid than the recipe called for. Oven temp and time the same. The cookies came out fine, even though I reduced the white sugar by half. A bit more “cakey” texture than I would have preferred. But not at all grainy, like some people said here. Next time I’ll reduce the flour a bit and maybe add another egg. I tried this because I’ve always like coconut in chocolate chip cookies, and when I learned that this flour is low carb, I figured it would be ideal for this recipe. I’ve had two issues with baking with coconut flour that I’m hoping you can help with. The first is that every time I make pancakes with coconut flour they always come out black on the outsides, even if the temp is way down. Definitely not the golden color you see in the recipes. Also, I’ve tried making two tested recipes for bread and neither one cooked in the center after having to doube the cooking time. I’m using a glass bread pan. Have you had issues with like these? I am inquiring about coconut flour. Do you know where I can purchase unflavored/unscented coconut flour? Thank you. I bought my flour from Tesco. I hope that’s what you are looking for. This may seem like a (very) silly question, but I would like to take a classic sour cream waffle recipe and substitute the regular flour for coconut flour – would this be possible and how exactly would one modify the recipe? Thanks!! I enjoying using all types of flours. I am using brown rice flour, buckwheat flour, spelt flour, coconut flour, almond flour and do have flax seeds. I tried something… put sun flower hearts (the edible part) in a coffee grinder and use that as a flour, but make sure the sunflowers are unsalted. Being unsalted means they absorb less oil. Also, put roasted pumpkin seeds into a coffee grinder, it tastes much like popcorn. Another tip, bananas that are frozen seem to separate and you get something like a banana oil, so much better for baking. I’m just learning about coconut flour and haven’t used it. Would I be able to make biscuits with it. I make really easy tasty little pancakes or pikelets. 2 eggs, a splash of rice milk or milk of your choice, around a tablespoon of coconut flour and a banana. I dont measure just add to make right consistency. Blend. Pour. Cook. Flip. Serve with squeeze of lemon. Natural yogurt. Strawberries. Today will be my first attempt at using coconut flour to bake. My recipe calls for 2 cups all-purpose flour, 2 large eggs, and no liquid aside from a small amount of bourbon & vanilla extract. It also calls for 1/2 cup Greek yogurt & 3 mashed bananas. I would like to make Zucchini Bread with coconut flour. How would you recommend I substitute for the all purpose flour I normally use. I have been using coconut flour for a couple of years, but I found a new favorite use for it. Dredging okra! For years our family battled over whether sliced okra should be dredged in flour or cornmeal before frying. I no longer deep fry, but roast most things which were formerly fried. Coconut flour is so much better with its drying properties. It takes away the “sliminess” of cut okra. My new favorite way to cook okra is to slice the pods, toss in a pan with coconut flour, spread in a single layer on an oiled sheet pan, drizzle with olive oil, and roast at 375 degrees for 20 minutes, turn the slices, and roast another 20 minutes or until browned and crisp. Toss with salt and eat, or cool, spread in a single layer on a pan and freeze individually, then bag and label for the freezer. Reheat in the oven. Can coconut flour get old? I have had some organic coconut flour for over a year. I bought it for one recipe and then forgot about it. It has not been in the freezer or refrigerator. Should I toss it, or can I still use it? I’ve been using coconut flour for years. Lately I’ve been mixing it with tiger nut flour and/or arrowroot flour. The tiger nut flour adds body and the arrowroot flour adds a finer texture. You still need more than normal eggs, but not as many as you do just using coconut flour. I use the same mixture (playing with the percentages) for crepes, with very good results as well, and for cookies too. I am hoping I can correct my error from my first try. I had not found you. My husband has found out he is in early stages of being diabetic. His numbers are low enough if we can keep them down. — he would not need meds, with His diet under control. Any help is greatly appreciated. He likes Peanut Butter , Snickerdoodle, and chocolate chip cookies. I would love to make the recipe below using coconut flour (any gluten/wheat-free flour [would tapioca work?]) instead but i could use some help with the alterations. I have never made desserts using coconut flour as a substitute; i just know it isn’t an equal swap. Any and all help appreciated! I’m not in a position to make recommendations for substitutions on recipes I haven’t developed or made. I would like to try a bread machine recipe using coconut flour, where can I find some? This may be a ‘dumb’ question but, can you use coconut flour to make hardtack? I don’t think I’d use it as the only flour but to add nutrition. Not fond of the texture of baked goods made with coconut flour. I also finds it tastes too eggy for my liking. Is there anything I can add to it to get the texture of wheat baked goods? Absolutely nothing, Daphne. Not being a grain-based flour, it will always be a bit gritty, a bit eggy and taste like coconut. Hi, I would like to know how I can sub coconut flour for cake flour (e.g., Softasilk, Pillsbury, which are basically made up of bleached wheat flour & B vitamins) when I make chiffon cakes. Ty. I would like to make coconut pecan cookies with coconut flour, any one have a recipe that doesnt use any other flours? I always experience a rough texture when using coconut flour, what am I doing wrong? You can’t expect coconut flour to have similar texture to grain-based flours. It is rough. That said, you might try a few different brands to see if one is finer. Can eggs in a recipe using coconut flour be completely replaced with, say, apple sauce? I don’t eat or use eggs, except for rare baking, and hesitate to buy a dozen eggs when I’ll only use one or two. No, you can’t substitute applesauce. I have a favorite recipe for pumpkin pudding that calls for 1/4 cup of wheat flour to help solidify the pudding, which uses 1 1/2 cups of pumpkin puree, 2 cups of milk and 2 eggs (and of course various other spices and flavorings) At your ratio, that would mean only 1 Tbsp of coconut flour instead of the flour. Could that really work? You could try and let us know how it goes. I will try your methods from now on. Just made cookies using someone elses 3 ingredient method. flour, butter and honey. look like cookies but sooo dry. I wished I’d seen this first. I substituted 1:1 for a biscuit bar recipe – it was awful. I made it eventually into a dough and baked it but it doesn’t hold together. Is there anything I can do other than throw away the cooked stuff? I have a recipe that I wanted to use coconut flour instead of regular flour. The recipe calls for 1 cup of flour and 4 eggs. In order to use the coconut flour instead, how many eggs and coconut flour would you suggest using? Coconut flour doesn’t make for a clean substitute for regular flour, and I don’t recommend converting recipes to use it. What is one cup in grass please? I don’t understand your question. A cup is a cup. Thanks so much for the info. Trying it tonight with my mom’s brownie recipe. I came across this article searching for a conversion chart to use coconut flour in a recipe I already have for cookies that uses regular wheat flour. I’m sure glad I read it, and doubly glad it was here to read. You probably saved me a few bucks and an aversion to coconut flour. Thanks! I would like to make roti using coconut flour and sweet potato. Other roti recipes I have seen use a 1:1 ratio of grain flour to sweet potato. Should I try 1 cup sweet potato to 1/4 coconut flour at first? Thanks for the tips. I like using coconut flour for cookies, but they definitely have a heavy texture.